So Lewis Hamilton holds the edge over Nico Rosberg and ends a miserable run of form in qualifying which stretches back seven races. Can he turn pole into victory tomorrow and thus chip away at Rosberg's 29-point championship lead? Join me from 12:00 BST to find out. Until then, it's a very good afternoon from me. Ciao. qualifying report or keep an eye out for video highlights on the website later this afternoon. You may also be interested in hearing from McLaren chairman Ron Dennis who says the tensions between title rivals Lewis Hamilton and Nico Rosberg could result in one of them leaving Mercedes at the end of this season. "I'm a bit disappointed, ninth isn't something to get excited about," says Red Bull's Daniel Ricciardo. "As a team, we would have loved to have been closer to the top five. Fingers crossed we have better race pace tomorrow. "The start is going to be crucial. Once everyone gets going, with top speeds, it's going to be tough for us, especially as it looks like it's going to be a one-stop race. "It's OK," says Ferrari's Fernando Alonso, who starts seventh. "In the end, I'm happy. I have a huge support here, the people are crazy about Ferrari. They hope a Ferrari will win. They will see me qualify seventh, but it doesn't matter. Tomorrow they think that you will win. That motivates me a lot. Hopefully we can give them something in return." Dean: Lewis has been in this position before, racing for a World championship. On the other hand Rosberg hasn't. Pressure. AADZ: Tension between Hamilton and Rosberg is there for all to see. Wow. Cut the tension with a knife!! "We're always going to be faster and slower in different parts of the lap relative to each other," says Nico Rosberg when asked baout his lap compared to team-mate Lewis Hamilton's. "Relative to my own lap it was an OK lap and from that second position is still good for tomorrow. "In the race anything can happen and we need to work towards the race and get a good strategy and have a good race. For the team again, even at a track like Monza, even coming here and being so dominant. There's still the race tomorrow but it's still really awesome for the team." When asked if he can challenge the Mercedes of Lewis Hamilton and Nico Rosberg in the race, Valtteri Bottas, who starts third, says: "I really hope so. From Friday to today they had a bit more pace. We hoped we could be close to them. I think we have a solid race pace. " Lewis Hamilton adds: "Free to race, that's the decision so it continues as usual. I hope tomorrow will be good. It would be really good to get another 1-2 for the team. I hope we have some competition with these guys (Williams) - I think that would be great for the fans." Lewis Hamilton is keeping a lid on his emotions and expression in the news conference. "I feel excited for tomorrow," he says. "I'm very proud of my guys on my side of the garage. They have been through the difficult times with me. They've done a remarkable job bouncing back, so we've done this as a team and it's great to have another 1-2 for the team." James Blyth: That's how it's done, fair game for once and Hamilton on top. Bring on tomorrow. David Nestor: First chicane could be interesting tomorrow!! Can't wait for lights out! The top six cars on the grid are Mercedes-powered, with Mercedes heading the field followed by Williams and McLaren. Ferrari-power is the next best with Fernando Alonso in seventh. "It was close," said Red Bull's reigning champion Sebastian Vettel, who starts eighth. "I'm not entirely happy, the gap is so close so you always think you could have gone quicker. But overall, I think it was what we could do. [In the race], we should be quicker than McLaren - it's difficult to say where Ferrari are but we should be quicker than them. "I think Williams and Mercedes are a bit too quick - but you never know. It's easy to say 'maybe we can pick up on other people making mistakes', but first of all you have to look after yourself." Luke Spurdle: An amazing well deserved pole position for Lewis Hamilton. Let's bring on the race tomorrow. Ben Silveston: That pole lap by Lewis Hamilton - simply brilliant! Another Mercedes lock-out! Nigel Gilbert: As soon as Hamilton's car works properly, he's fastest. Simple as that. "All weekend it's been pretty good, just tweaking the set-up throughout the weekend," says Jenson Button, who starts sixth. "We are surprised at how quick Williams are. The Lesmos were very clean on my final run, but it's OK - fifth and sixth. Our long runs on Friday were not as good as our short runs but we'll see what happens." All smiles as Lewis Hamilton, Nico Rosberg and Valtteri Bottas pose for the top three photo. They wave to the fans before heading off to the news conference. David Coulthard points out that there was no handshake between Lewis Hamilton and Nico Rosberg after they climbed out of their cars. Kevin Magnussen improved on his final run to leapfrog McLaren team-mate Jenson Button into fifth. Meanwhile, Sebastian Vettel got the better of Daniel Ricciardo for a change. Lewis Hamilton is told he has got pole position. What's his response? "Did anyone else improve?" He knows it's job done but it's tomorrow that counts. At last, Lewis Hamilton turns his fortunes round and makes it happen in qualifying, the Briton taking his third pole position at Monza and first since the Spanish Grand Prix in May. Lewis Hamilton takes pole position for the Italian Grand Prix. Nico Rosberg improves but it's not enough to steal pole position! He stays second, with Valtteri Bottas in third. They're all back out. This is it. One final run for everybody. What has Rosberg got left? All 10 cars head back to the pits for new boots ahead of one final run. Hamilton leads Rosberg ahead of Bottas, Massa and Button. Vettel, Alonso, Magnussen, Ricciardo and Perez complete the top 10. It's a stunning opener from Lewis Hamilton, the Mercedes driver clocking a 1:24.109 which is a massive four tenths off a second quicker than Nico Rosberg. At last, a trouble free run in qualifying. Pressure well and truly on the German now. Nico Rosberg goes quickest with a 1:24.552, just over a tenth quicker than Valtteri Bottas in second. Johnny Welbeck: Could be the one of the most important Q3 sessions of the season. Suhaib: Kimi looks a bit too nervous with the Ferrari this season. He needs to step up, or out. Sergio Perez clocks a 1:26.230 to get us off the mark. All other nine drivers are now on track, so we should have an early picture shortly. Sergio Perez is the first man out in the Force India. And then there were 10. Let the pole position shoot-out begin! Super Mario: Kimi Raikkonen doesn't look like the driver he once was. Emma Henry: Ah! Kimi! I love you but you really aren't setting the world alight this season. Jay McMahon: Raikkonen should hang up his gloves and return to WRC, other drivers deserve his seat. Daniil Kvyat will start 21st tomorrow because he became the first driver to be hit with an engine-related grid penalty this season. The Russian will drop 10 places as a result of using his sixth engine. Kimi Raikkonen made a mistake at the second chicane and can't improve, so he'll start tomorrow's race from 12th. That'll be disappointing for the home fans. His Ferrari team-mate Fernando Alonso is up in fifth. Lewis Hamilton finishes fastest in the second part of qualifying for their Italian Grand Prix. Kimi Raikkonen makes a mistake on his second run, so decides to back off before going again. Nico Rosberg, Valtteri Bottas and Felipe Massa stay second, third and fourth. Kevin Magnussen, Daniil Kvyat, Jean-Eric Vergne, Nico Hulkenberg, Esteban Gutierrez and Adrian Sutil are in the drop zone, with Kimi Raikkonen on the bubble in 10th. Lewis Hamilton gets a lap on the board - and it's a good one. A 1:24.560 is the quickest of the weekend and a tenth better than Mercedes team-mate Nico Rosberg. Valtteri Bottas is third with Felipe Massa fourth and Fernando Alonso fifth. Jenson Button is sixth with Sergio Perez seventh. Sebastian Vettel goes sixth, just a few thousandths quicker than Red Bull team-mate Daniel Ricciardo with six minutes remaining. Felipe Massa goes third with Fernando Alonso having a bit of a wobble through Parabolica, which somewhat explains why he's eight tenths of a second off the pace in fourth. Nico Rosberg clocks the fastest lap of the weekend with a 1:24.682, two tenths quicker than the Williams of Valtteri Bottas. Nico Hulkenberg is the first driver to set a timed lap, the German clocking a 1:31.488 in the Force India. Lewis Hamilton, Jenson Button (pictured), Sebastian Vettel and Daniel Ricciardo have yet to leave the garage. Danny Welbae: Lotus, for the past two seasons, have had a car that was capable of challenging for the championship. What on earth has happened? Rachel Bridge: Never thought I'd agree with Juan Pablo Montoya... but I reckon Rosberg might sneak pole. It's time for round two. Another six drivers will take an early bath. Lotus: We expected qualy to be tough for us here. It was. Lewis Hamilton finishes fastest in the first part of qualifying for the Italian Grand Prix. Super lap from Kamui Kobayashi who moves up to 19th, ensuring he beats both Marussias and his Caterham team-mate Marcus Ericsson. A good response after he got dropped for Andre Lotterer at the last race at Spa. "OK Pastor, do not change gear. We may have a problem with the car." That's not the first time Pastor Maldonado has heard that kind of radio message this season - and it probably won't be the last based on Lotus' woeful form. Mighty Joe: Definitely potential for Williams F1 to challenge the Mercedes today. Good effort from Jean-Eric Vergne, who is on the hunt for a seat next year after being let go by Toro Rosso. The Frenchman is currently fifth fastest, a tenth quicker than team-mate Daniil Kvyat. Jules Bianchi, Adrian Sutil, Kamui Kobayashi, Max Chilton, Marcus Ericsson and Romain Grosjean are currently in the drop zone. "Across a weekend in Monza teams are spending £300,000 on front and rear wings alone." It's a tidier lap from Lewis Hamilton next time around, the Briton moving back into P1 by a tenth of a second. Meanwhile, Romain Grosjean heads out for the first time with five minutes remaining. "That was a pretty shocking lap," says Lewis Hamilton, who doesn't improve and stays second. However, he's bumped down a place when his Mercedes team-mate Nico Rosberg sneaks into top spot by 0.035 seconds. "You're well inside the cut-off," says the German's race engineer. Lotus: Finishing touches to Grosjean's car after late fluid leak. Anyone seen where we put the nose? Felipe Massa goes fastest! The Brazilian is the only non-Mercedes driver to take pole position this year. He's 0.043 seconds quicker than Lewis Hamilton. Meanwhile, the Red Bulls of Sebastian Vettel and Daniel Ricciardo go eighth and ninth. Lyndon Roberts: Rosberg for pole. Button looks surprisingly quick & expect Alonso to battle with Williams for 2nd row. David McMillan: Looking very close among the pack today & great to see Alonso up front. Quali predictions. P1 Hamilton P2 Rosberg P3 Bottas P4 Alonso. With 10 minutes remaining, Valtteri Bottas goes fourth quickest, half a second off the pace, with Kevin Magnussen fifth. Lewis Hamilton pumps in a cracker, matching his time from this morning, to go quickest, with Felipe Massa following him over the line 0.036 seconds off the pace. Nico Rosberg, running the hard tyre, goes quickest with a 1:25.862. The German benefitted from slipstream off a Marussia. Fernando Alonso is second, with Daniil Kvyat third. Kamui Kobayashi is the early pace-setter, with only six cars having completed times. Meanwhile, Romain Grosjean is not even in his car as a bunch of mechanics work on his Lotus. Mighty Joe: Buckle in for the fastest qualifying session of the season! Rian Hoskins: To get his confidence back to beat Rosberg, Hamilton must start on pole position, get a fast start and put in a dominant performance. Lewis Hamilton is told that he will be doing fliers on laps two, four and six on his opening stint. Here we go, then. Time to get this show on the road. It's an 18-minute session with the six slowest drivers given the boot. Qualifying is almost up on us! Don't forget our extra camera streams, available at the top of this page and on the F1 pages for mobile users. Force India: The baking hot pit-lane has been cleared. Time for business! "Fernando Alonso's fastest lap in final practice, which put him second fastest behind Lewis Hamilton's Mercedes, was a thing of exquisite beauty, and Ferrari were as admiring of it as those of us watching from the sidelines in the media centre or trackside. But they are far from sure he can repeat that position in qualifying. They're expecting a third row grid slot at best, believing Mercedes and Williams to be out of reach." Lee McKenzie reports that Ferrari president Luca Di Montezemolo said he will be the first to tell the media when he decides to go and it won't be this weekend. Lewis Hamilton has not beaten Nico Rosberg in qualifying since the Spanish Grand Prix back in May. Rosberg has been on pole in six of the last seven races. Can Hamilton hit back in Monza after Rosberg's mechanical problems this morning? David Ferguson: Great to see Alonso hanging it right out in FP3. Can he get the Ferrari on the front row? Mercedes have scored 11 pole positions to date. 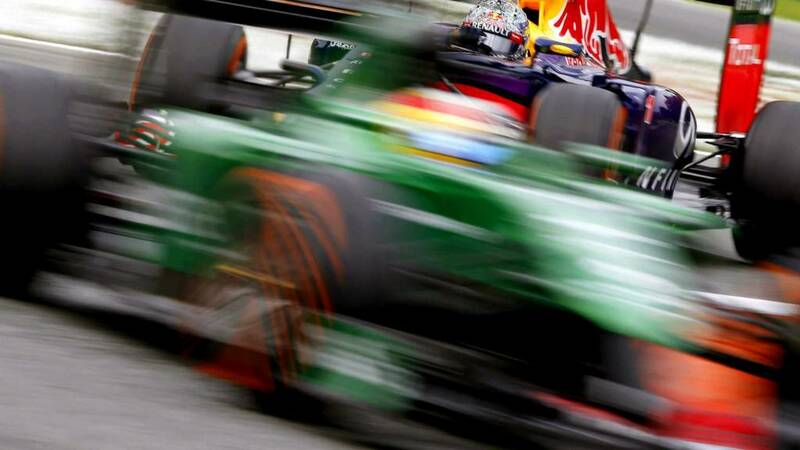 Just five teams have managed more in one season - Red Bull, McLaren, Williams, Lotus and Ferrari. Red Bull hold the record with 18 in 2011. "The temperature and tension are really building here as the clock counts down to qualifying. The sun is shining, it's a balmy 25C and the atmosphere as ever is electric at this wonderful old track. In the paddock, much of the crowd is at Ferrari, and the waiting media crews got what they wanted when president Luca Di Montezemolo came out, with the result the inevitable scrum. "I didn't hear what he said, but I believe it unlikely to have been an admission of his expected departure from the company, which has been widely reported in the Italian media. We're told that is likely to happen some time after Di Montezemolo announces record profits for the company at the Paris Motor Show in October, and the legendary figure - in F1 and in Italy - is expected to move to run the Alitalia airline. Ferrari are saying nothing on the subject." "I still think Nico Hulkenberg is top of the list at Ferrari, but that depends on what Raikkonen is going to do. I think Hulkenberg will do another year at Force India and then see what's available. It's interesting because I think he can become a world champion in the future." Nico Hulkenberg has headed out to the old Monza banking with David Coulthard to reflect on what has been his best season in Formula 1 to date. His tally of 70 points this season is already higher than any of his previous three seasons. The German says while he's not expecting to win this weekend, the car has the pace for a strong result on Sunday. There are currently no Italian drivers in Formula 1, however, you may not know that Red Bull's Daniel Ricciardo and Williams' Felipe Massa hold Italian passports due to their ancestry. Marussia's French driver Jules Bianchi also has Italian roots. Is qualifying important in Italy? Well if you believe the statistics, it's a resounding yes. The Italian Grand Prix has been won from pole 11 times in the last 14 years, making it more important than in Monaco, which has only been won from pole nine times in the same period. Faisal Reza: Looking forward to a nice clean Mercedes battle this afternoon. Come on guys, play nice! Old Nicodemus: Ha! Toto reconsidering his words. He is not going to find any better drivers than the ones he's got already. Here's a shot of the new Sochi circuit, which weaves its way around the venue that hosted the Winter Olympics earlier this year. The race is set to take place next month. Sebastian Vettel says it would be nice to have a chat and shake hands with Fernando Alonso, following some exciting battles between the pair throughout the year. "He doesn't talk to me much!" he says. Four-time world champion Sebastian Vettel is supreme form as he drives around the new Sochi track that'll host the Russian Grand Prix. David Coulthard is clearly a pretty nervous passenger. Lewis Hamilton has work to do. He's 29 points behind team-mate Nico Rosberg at the top of the standings - that's more than a race win (25 pts). Daniel Ricciardo is Mercedes' nearest challenger, 35 adrift. He's scored more points than either of Mercedes drivers in the last six races. Daniel Ricciardo, who is third in the drivers' championship: "Qualy's gonna be tight. We all got a good scrap ahead of us. Just gotta use the right foot a little more than the others." Monza is essentially a series of long straights broken up by a few corners so you'll be unsurprised to hear the track holds the record for Formula 1's fastest lap, an average of 262.242 kph set by ex-Williams and McLaren racer Juan Pablo Montoya before qualifying in 2004. "Kimi Raikkonen's renaissance continues at Ferrari. After struggling to get anywhere near team-mate Fernando Alonso for the first half of the season, there have been signs of progress recently. In Hungary he said he was happier with the feeling of the car. "In Spa last time out, he actually beat Alonso in a race for the first time all season, albeit only after the Spaniard received a five-second penalty at a pit stop for his mechanics being on the grid too long - which left him stuck behind the McLaren of Kevin Magnussen for most of the race. "And here the two have looked pretty evenly matched. Alonso was on top in first practice and Raikkonen in second, although that was after Alonso made a mistake and ran wide at the first chicane. Still, there are signs the long-anticipated battle between the two might finally be brewing up." You could say it's all even for the weekend at Mercedes.Lewis Hamilton had an electronics issue yesterday, which curtailed his running on Friday. Nico Rosberg then lost running this time morning. Mercedes say the drivers can continue to race freely, but they must not collide. If they cannot be managed, co-team boss Toto Wolff says they could consider changing the line up. Wolff tells Eddie Jordan: "We had a difficult situation, we have new broke new ground. Absolutely, there are things we could do better." Nico Rosberg had a gearbox issue in final practice earlier today, which meant he missed most of the session. However, the team report that the issue is now fixed and the car is going back together. There was no need to change the gearbox, so he avoids a penalty. Dr Y: Qualifying today is so important for the title race. Come on Hamilton! Sam Parry: The Nico-Lewis drama is going to make an excellent movie in a few years. CJeD: Is Rosberg's gearbox 'problem' part of his punishment of the last race incident? Reach for your remotes - or click play on the video console at the top of the page because Suzi Perry, Eddie Jordan - in a disappointingly standard dark blue shirt - and David Coulthard are up and running on BBC One. Hello and welcome to Monza, host of round 13 of the 2014 Formula 1 World Championship - the Italian Grand Prix. Practice time is over, it's all down to qualifying, which starts at 13:00 BST. It's that time again, when drivers get behind the wheel of their multi-million pound machines, flick down their visors and channel their focus on one thing - nailing it a single flying lap. On Friday, Lewis Hamilton had the bad luck. Today, it was his team-mate Nico Rosberg's turn. Both have lost track time but who will come out on top in qualifying? Join me back here shortly to find out. Right then, folks. It's time for a late morning espresso. I'll be back at 12:10 BST to begin building up to qualifying. Highly respected Italian journalist Pino Allievi says it seems it is true this time that Ferrari president Luca Di Montezemolo will leave the Italian outfit soon. The session may be over but work continues over at Mercedes as they battle to fix Nico Rosberg's gearbox before qualifying, which starts at 13:00 BST. Inside F1 with Lee McKenzie and Allan McNish. Lewis Hamilton's father Anthony says his son has had a "normal" couple of weeks and is a good frame of mind. He adds that he still thinks Lewis will win the championship, despite being 29 points adrift of Mercedes team-mate Nico Rosberg. BBC F1 pit lane report Tom Clarkson has grabbed Mercedes co-team boss Paddy Lowe to find out more about Mercedes' mechanical issues this weekend. "There's an electronic problem effecting the gearshifts [on Rosberg's car]," said Lowe. "We don't think he'll get a penalty. We're just changing parts we're permitted to change. We're pretty confident he'll be ready for qualifying. "It's not great for either of them [Hamilton had an electrical problem on Friday] to miss time and we're disappointed we have lost that time for them. It's probably worse to lose time today to be honest." Williams chief technical officer Pat Symonds. "We haven't been there to pick up when Mercedes have not had their best days. "We need to do that. We need to be up there consistently. We're aiming for podiums - and hopefully a win - before the end of the season." John: Hamilton is such a talent, top of the board on the harder tyre and the others can't catch him on the medium. Gino Bedwell: The story of "the tortoise and the hare" springs to mind this weekend. @MercedesAMGF1 much quicker, but problems loom. Valtteri Bottas' brakes are smoking as he pulls into the pit lane to bring his session to an end. It's been a good day for the Williams driver, the Finn ending up third quickest. Lewis Hamilton finishes fastest in third and final practice for the Italian Grand Prix. Second time around, Lewis Hamilton does improve on those medium tyres, the Mercedes driver clocking a 1:25.519 to extend his advantage to fourth tenths of a second. Lewis Hamilton: "These brakes aren't very good, man." Ferrari president Luca Di Montezemolo is in town, the 67-year-old strolling across the pit lane to give the fans in the grandstand opposite a wave. He then heads back to the garage and gives Fernando Alonso a big embrace. Alex Southgate: Ferrari has it all to do to get a good chance of a podium, which Alonso can do. Liam Fassam: Loving seeing @JensonButton and @McLarenF1 at the sharper end of proceedings. Felipe Massa goes fourth, a few thousandths of a second behind Williams team-mate Valtteri Bottas which shunts Jenson Button down to third. Lewis Hamilton can't improve on his leading time, having put on the mediums, and crosses the line 0.003 seconds down. Jenson Button goes third quickest, splitting the Ferraris but half a second off the pace set by Lewis Hamilton. Still, McLaren looking in good shape here. Red Bull's Daniel Ricciardo goes fourth quickest on the mediums, a massive seventh tenths down on Lewis Hamilton's time, which was set on the hard tyres. Lewis Hamilton pits to swap his hard tyres for the mediums. Adrian Sutil is out at last and goes 17th quickest with his first effort, three seconds of the pace. Good effort from Jules Bianchi so far in the Marussia. He's currently 16th, quicker than a Sauber and a Lotus. Jordi Hales: Gearbox issues for Nico. Chance for Lewis to steal pole if Nico gets a penalty. Peter Murton: Can the Marussia out qualify the Lotus today? What's the possibility? "The race simulation times late on Friday practice suggested a close, competitive weekend. Nico Rosberg, both Red Bull drivers and Kimi Raikkonen's Ferrari were all within 0.06secs of each over an average of their runs. But they were all 0.3secs slower than Williams's Valtteri Bottas, while the other Williams of Felipe Massa was strong on the hard tyre. "Fernando Alonso pretty much matched Bottas's pace, but on a much shorter run. And Lewis Hamilton was 0.2secs quicker still, but again only over three laps. But that's race pace on Friday. Mercedes usually stretch out a bit of an advantage when it gets serious come Saturday. Will that happen again?" Kimi Raikkonen's first flying lap on the medium tyres is disappointing, the Finn going third, six tenths off the pace and four tenths slower than Ferrari team-mate Fernando Alonso. McLaren and Ferrari are keen on signing Lewis Hamilton if the 29-year-old chooses to leave Mercedes according to Daily Mail and Guardian respectively. Read more F1 gossip here. Fernando Alonso is the first man to switch to the medium tyre and promptly goes second fastest, 0.189 seconds off the pace set by Lewis Hamilton on the hard compound. "The brakes don't feel like they're working very well," says Lewis Hamilton, who missed the first chicane on his last lap. "The DRS is not working either." "There has been a lot of talk this weekend about the changes to the run-off at Parabolica, where the gravel trap on the immediate outside of the corner has been replaced by the increasingly mandatory asphalt. The drivers in general don't seem that keen on it, many saying it reduces the challenge of the corner. But one effect of it is that the corner is a bit faster. "Jenson Button said: 'I'm definitely carrying more speed in than last year because you're not so aware of the gravel which was just on the edge of the circuit. But I am still not sure if I like it or not.' Whether that makes it better or worse is a matter of opinion." Stonking lap from Lewis Hamilton, the Briton pumping in a lap that is 0.8 seconds quicker than anyone else - and he's still on the hard tyres. Adrian Sutil has yet to complete a lap in this session. That's because his Sauber C33 has a hydraulic leak which the mechanics are busy working on trying to fix. Sergio Perez has stopped out on track. It looks like he's stuck in gear. The yellow flags are out while the marshals push the Force India off track. fastest lap in F1 history during the 2004 Italian Grand Prix race weekend, has made the trip over to Italy from the United States, where he is racing in the IndyCar series. seen here chatting to his former race engineer Phil Prew in the McLaren garage, left the sport in 2006 having secured seven wins and 30 podiums from his 95 races. "McLaren looked in decent shape on Friday, in the mix on one-lap pace with the Ferraris and Red Bulls. But Jenson Button said he had 'no idea' where the team stood on pace. Bizarrely, he and team-mate Kevin Magnussen - just 0.12secs slower - gave directly opposed assessments of their relative potential, Button saying they were 'quicker on short runs than long', Magnussen the opposite. In truth, the race pace of neither was particularly strong, although the Dane was a couple of tenths faster." "The times are very close," says Red Bull boss Christian Horner. "A tenth of a second can move you three or four places. It's massively close between the top six or eight cars. It'll be about getting the perfect lap in qualifying. "I think our race pace looks good. It's looking like a one-stop race which means you will have to do your overtaking on track. That will be tough for with our lack of straight-line speed." Lewis Hamilton is focusing on longer runs this morning. He's currently 13th fastest, having completed 10 laps. Mercedes report that Nico Rosberg's session is over because of a gearbox issue. The car is now jacked up in the garage. Valtteri Bottas goes quickest with a 1:26.693, with Fernando Alonso clocking the exact same lap time to slot into second. Felipe Massa is only a tenth further back in third. Daniel Ricciardo goes second, with Nico Hulkenberg third and Sebastian Vettel fourth. No lap times from Nico Rosberg, Kimi Raikkonen, Fernando Alonso or Felipe Massa yet. Lewis Hamilton is out on track and has completed six laps so far. He's currently eighth fastest, 2.1 seconds off the pace set by Jenson Button. "There is, as ever, a great deal of speculation this weekend about Ferrari, and for once much of it centres on president Luca Di Montezemolo, although of course Fernando Alonso's future continues to be a subject for debate. As for Di Montezemolo, the word is that his time in charge of Ferrari - which dates back more than 20 years - is coming to an end. "It seems he will some time later this year - perhaps after he has had a chance to announce the company's best ever financial results at the Paris Motor Show in October - move to run Alitalia, the Italian national airline, which is poised to be taken over by Abu Dhabi's Etihad. "The link between Abu Dhabi and Montezemolo is that the Arab state also owns part of Ferrari. It is thought likely that Fiat chief executive officer Sergio Marchionne will dovetail his role with the presidency of Ferrari, and that new team principal Marco Mattiacci - who is a Fiat protégé and close to Marchionne and president John Elkann - will stay on. There continues, however, to be rumours about Ferrari's interest in Ross Brawn." It's a warm day at Monza, with air temperatures up at 22C with the track 31C. Sebastian Vettel, the reigning world champion who has not led a single race lap this season, goes fourth fastest with his first effort. Everyone has completed an installation lap - and we've even got a few times on the board, with Jenson Button's McLaren leading the way. This one-hour session is key for teams to tinker with set-ups and get a qualifying simulation under their belt before the pole position shoot-out later today. The engines have been fired up, the drivers are in their cockpits and the sun is out. Let final practice commence. We're live on BBC Two with Lee McKenzie your host. Tom Clarkson and Jennie Gow are in the pit lane while Allan McNish and Ben Edwards are your commentary team. "It was only a matter of time, but Toro Rosso's Daniil Kvyat has become the first driver to be hit with an engine-related grid penalty this season. The Russian will drop 10 places this weekend as a result of using his sixth internal combustion engine. There is the same penalty for using a sixth example of any of the elements of the engine - ICE, MGU-H, MGU-K and turbo. He won't be the last, that's for sure. Red Bull team boss Christian Horner has already said it is inevitable that Sebastian Vettel will get at least one, and there will be others as well." BBC F1 pit lane reporter Jennie Gow reports that Lewis Hamilton will have to use some of team-mate Nico Rosberg's data because he missed so much time in second practice on Friday. However, she says Hamilton isn't too bothered about that because they're quite similar in terms of feel for the car. That said, Hamilton will want to get out nice and early in this session to make up some ground. Nico Rosberg leads the way in the drivers' standings, the German holding a 29-point lead over Mercedes team-mate Lewis Hamilton. Daniel Ricciardo is in third, 35 further back. "Fastest he may have been on headline times, but Nico Rosberg was a concerned man after Friday practice. 'It seems that we are quick on one lap but on the long run the others were very fast,' he said. 'I didn't feel 100% confident in the car, so I can't be happy with today and I have a lot of work to do overnight.' How competitive were 'the others'? Very, it seemed. The best average lap time on the race-simulation runs was by Lewis Hamilton - but he only did three laps. Of those who did a proper run, it was Williams's Valtteri Bottas ahead. Williams were expected to be quick here, but could they genuinely challenge the works Mercedes?" So the plan for the day is simple. One hour of final practice kicks off at 10:00 BST and that's followed by qualifying at 13:00. The build-up show on BBC One gets going at 12:10. Adjust your schedule accordingly. Ferrari's Kimi Raikkonen arrives in style this morning with hundreds of fans lining the path to the main entrance. They've got Ferrari fever. Williams: It's warming up here in Monza, could be around 27 degrees later. That'll help those tyres, that fly looks happy too! "What Lewis Hamilton really needed at the Italian Grand Prix was a smooth weekend, but already that hope has evaporated. Blisteringly quick in first practice on Friday, an electronics problem kept him in the garage for two-thirds of the second session, costing him valuable track time. Even so, the auguries are good as he embarks on his preparations for qualifying. "Despite his problems, and despite being held up at the Ascari chicane on his quickest lap, Hamilton was only 0.061secs down on team-mate Nico Rosberg in second practice, and was very happy with a car which he says 'feels great'. He's more than aware, though, that he needs a good day on Saturday to get the pole position that would be the foundation of the win that would start his championship fightback. 'Would be great to have a trouble-free qualifying,' he said." Welcome to Monza, welcome to the land of Ferrari, welcome to third and final practice for the Italian Grand Prix. You need to go back to the Spanish Grand Prix in May to find a trouble-free weekend for Lewis Hamilton - that's a run of seven races of misfortune. That continued on Friday as a electronics issue meant the Mercedes driver missed an hour of second practice. Can he make up the ground before qualifying and the race? Let's find out.